With great pleasure I seat myself this evening to write you a few lines in ansur to yours of the 21 which came to home this morning. It found me well and harty and ___ providence to hear that you and family are well which is the greatest satisfaction to me of any thing elce in this world I am sorry to hear of the bad luck with your loss but better her than something else more dearer to us in this world. We must not murmer against the providences of bad that may hapen to us in this troblesom world it will be a great loss to you but the lord givith and the lord taketh away blessed be the name of the lord. We may have losses and crosses in this world but they are all for the best if we only would see it I hope your pains with her will be blessed. Soon I am on guard and wont have time to finish this lines this evening. We have butiful weather hear now. We still remain in our quarter yet there is some little picket fights on the front. There is no casyalitys of any concequence on either side. I will close for this time. I seat myself this morning to finish this letter. This finds me well and hardy and i hope these lines will come safe to your home and find you in the best of health. i have nothing of interest to write you all is quite hear yet. The weather is warm and fair spring has come at least evrything is getting green. Melissa you must do the best you can with your matters at home and that all anybody can do. I know you have a hard time but I do hope it wont be long before i will be spared and permitted to return home to help you. If you have bad luck you cant help that. So we must not murmur at any of our crisis or trials. Melissa if R.T. fetches a load don't fret yourself to too much trouble to send me things. I hope we will be here when he comes so what you send will do me some good. But that I don't know. there is no appearance at this time of us leaving here in a few days. I will have to close for this time. I hope to hear from you soon. May god bless and protect you is the sincere prayer of your true love. Whatever was causing Mollie Cooper such pain in the spring of 1864? We will never know at this late date. The pain and concern of the loss is great. We do know it was not a child or relative although we can see that it was causing her nearly that much pain. 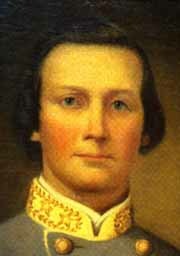 J.D was in the early part of Johnson's retreat toward Atlanta. He did not know it yet but he would loose a brother along the highway in front of him. He was also to be wounded. Franklin and Nashville were distant images of what might be. He did know that when Atlanta fell, with it went any hope that his new country would not be still born. The love of one another is always nothing more than the pain we are willing to endure for each other, how much pain did J.D. and Mollie endure? More it would seem than the modern heart could bear. Children would die, governments fall, battles would be fought, friends and loved one would depart, but the sun still came up over Paris Mountain every morning. Every morning Mollie Cooper left an empty cabin, looked at the sunrise, and wished J.D could see it. From Dalton to Bentonville, J.D. would watch the same sun rise, set, and wish Mollie could see it. Unlike many they knew and loved, they would live to watch the sun rise and set many times together from the cabin, then the home, at the base of Paris Mountain. What is important in life? God, family, and the love of one another... Everything about man can be told in about twenty stories and they all deal with his relationship to God, other men, or women. God Speed you J.D. and Mollie Cooper, cry for us, for now we must endure just as you once did. We are thankful that your cup is not ours and I suspect you are thankful that our cup is not yours. Only God lives forever� we should all be aware of that each moment. Do good to one another. Remember it is not what we have lost that is important, it is what we have found.